Even between rounds of cell division, during the so-called resting state, a cell stays busy, unpacking and repacking portions of the genome, accumulating epigenetic marks, and turning specific genes on and off. So, it stands to reason that all this activity would degrade histone proteins, the genome’s packing material, and that histone proteins would be in need of constant replacement. Yet histone replacement is poorly understood, at least in the “resting” cell, where the day-to-day routine unfolds between bursts of DNA replication. To hear the hum of histone turnover without the clamor of replication, scientists at the Babraham Institute and MRC Clinical Sciences Centre listened in on developing mouse egg cells, oocytes. Developing oocytes provide a system in which the packing and unpacking of DNA is relatively easy to study. Oocytes do not divide, and so there is no DNA replication. Also, in oocytes, genomes are highly active. As they mature and ready themselves for fertilization, oocytes turn genes on and off throughout the genome, which simultaneously undergoes epigenetic modification. The scientists found that by deleting the gene for a histone replacement protein, they could dampen the hum of histone turnover. Moreover, using single-cell analysis, the scientists evaluated how interfering with histone turnover affected egg cell development, DNA integrity, and the accumulation of DNA methylation. The results of this work appeared November 5 in the journal Molecular Cell, in an article entitled, “Continuous Histone Replacement by Hira Is Essential for Normal Transcriptional Regulation and De Novo DNA Methylation during Mouse Oogenesis.” This article describes how the scientists deleted the H3.3 chaperone Hira in developing mouse oocytes, and how they assessed the importance of continuous H3.3/H4 deposition in sustaining chromatin dynamics. Nashun et al., 2015, Molecular Cell 60, 1–15 Buhe Nashun, Peter W.S. Hill, Sebastien A. Smallwood, Gopuraja Dharmalingam, Rachel Amouroux, Stephen J. Clark, et al. DNA in all eukaryotic organisms is bound by nucleosomes, forming a physiological chromatin context in which all molecular processes involving DNA operate. The integrity of the chromatin template is constantly compromised by fundamental biological processes, such as DNA replication, repair, and transcription, following which the normal chromatin structure is restored with the help of histone chaperone proteins (Gurard-Levin et al., 2014; Ransom et al., 2010). Advances in recent years have shed light on some of the molecular players involved in chromatin assembly and maintenance, separating (on the molecular level) DNA replication-dependent and -independent pathways (Burgess and Zhang, 2013). Histone proteins themselves are central to these processes: the expression and incorporation of canonical histones is tightly coupled to DNA replication; in contrast, histone variants can be incorporated into chromatin independent of the cell cycle (Maze et al., 2014). While it has become increasingly clear that the activity of histone chaperone proteins is of critical importance during DNA replication and repair (Adam et al., 2013; Hoek and Stillman, 2003; Polo et al., 2006; Ransom et al., 2010), studies that have attempted to dissect the importance of histone replacement in the interphase nucleus have revealed only a limited contribution of histone chaperones and/or variants to transcriptional regulation (Banaszynski et al., 2013; Goldberg et al., 2010; Ho¨ dl and Basler, 2009; Sakai et al., 2009). These studies, however, have been complicated by the use of proliferative cell systems that could (at least partially) restore chromatin integrity through replication-coupled chromatin assembly (Banaszynski et al., 2013; Ho¨ dl and Basler, 2009; Sakai et al., 2009; Wyrick et al., 1999). Thus, the extent to which basic physiological processes, such as transcription, are dependent on or regulated by histone replacement remains unclear. To overcome the limitations of these previous studies, we took advantage of the unique system presented by mammalian oogenesis. Over an extended time span and in the absence of DNA replication, postnatal mammalian oocytes execute the oogenesis-specific developmental program, involving widespread transcriptional changes and de novo DNA methylation, ultimately acquiring the competencies required for fertilization and embryogenesis (De La Fuente, 2006; Li and Albertini, 2013; Tomizawa et al., 2012). Figure 1. 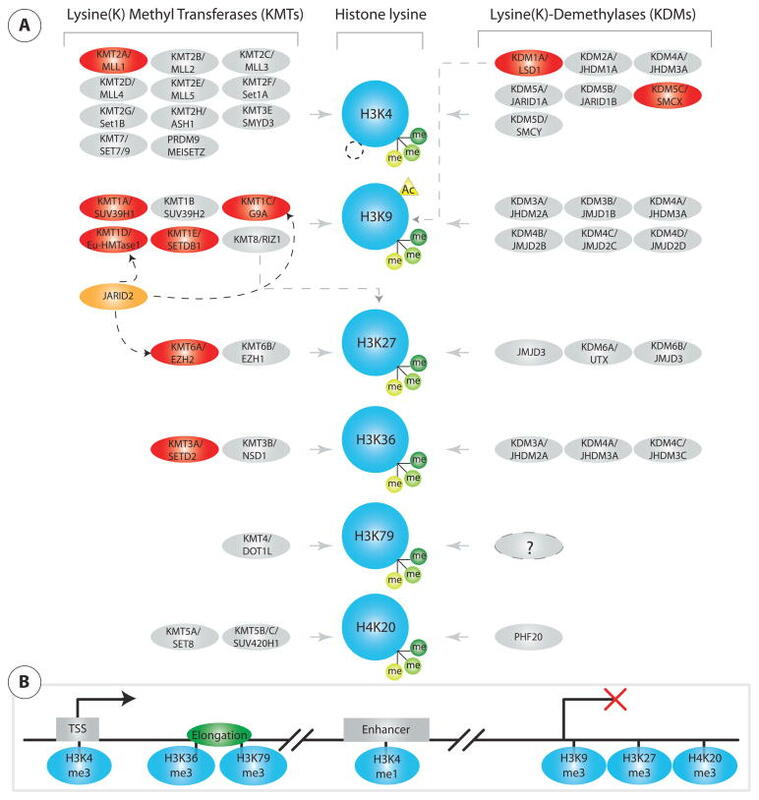 Incorporation of H3.3 in Developing Oocytes Is Driven by Hira (A) Schematic illustration shows developmental stages and global transcriptional activity during oogenesis with indicated onset of Gdf9-Cre+ and Zp3-Cre+ expression (adapted from De La Fuente, 2006; Lan et al., 2004; Li and Albertini, 2013; and Tomizawa et al., 2012). (B) Growing oocytes (postnatal day [P]14) were subjected to mRNA microinjection of Flag-tagged H3.1, H3.2, H3.3, or H2A.X. Incorporation of histone variants was visualized by anti-Flag antibody staining. Figure 3. Hira Deletion Leads to Increased DNA Accessibility and Accumulation of DNA Damage (A) Hira deletion leads to reduced histone load in the Hiraf/f Gdf9-Cre+ GV oocytes. The graph shows the quantification of the IF (pan histone antibody staining) signal normalized to DNA content (DAPI). (B) Structural alteration of chromatin in Hiraf/f Gdf9-Cre+ GV oocytes. Extensive chromatin de-condensation was observed in more than half of the examined Hiraf/f Gdf9-Cre+ GV oocytes. DNA was stained with DAPI and pseudocolored in gray. (C) Lack of Hira leads to increased DNase I accessibility. Schematic illustration shows in vivo DNase I TUNEL assay (left); see also the Supplemental Experimental Procedures. The fraction of oocytes with positive TUNEL signal is indicated in brackets. (D) Lack of Hira leads to the accumulation of DNA damage. The g-H2A.X staining of growing oocytes (P16, left) and GV oocytes (right) is shown. (E) Gene set enrichment analysis (GSEA) compares genes upregulated after DNA damage (Kyng_DNA_Damage_Up gene set) and the ranked list of gene expression changes in Hiraf/f Gdf9-Cre+ relative to Hiraf/f MII oocytes. NES, normalized enrichment score; FDR, false discovery rate (both were calculated in the GSEA program). DNA was stained with DAPI (in blue). Scale bar, 10 mm. Figure 4. Continuous Histone Replacement Mediated by Hira Is Required to Maintain the Full Dynamic Range of Gene Expression (A) Detection of newly synthesized RNA by EU incorporation in growing (P14) and GV (P20) Hiraf/f and Hiraf/f Gdf9-Cre+ oocytes is shown. Scale bar, 10 mm. (B) Comparison between obtained FPKM values and absolute copy number per cell for ERCC spike-in RNA in Hiraf/f and Hiraf/f Gdf9-Cre+ MII oocytes revealed no significant difference. (C) Principal component analysis of scRNA-seq data derived from Hiraf/f and Hiraf/f Gdf9-Cre+ MII oocytes is shown. (D and E) Selected gene ontology (GO) terms significantly enriched for among differentially upregulated (D, edgeR, FDR < 0.1) and differentially downregulated (E, edgeR, FDR < 0.1) genes in Hiraf/f Gdf9-Cre+ MII oocytes are shown. x axis represents Benjamini-Hochberg adjusted p value. (F) Number of annotated genes detected, as computed by HTSeq program, is shown. (G) Relative proportion of genes distributed among ten equally sized expression level bins. All genes detected in our RNA-seq experiment were divided into ten equal bins based on their expression levels in Hiraf/f oocytes. The gene number in each bin was counted for Hiraf/f or Hiraf/f Gdf9-Cre+ , and the percentage was calculated relative to all genes detected in a given sample. (H) Boxplot shows gene expression levels of differentially upregulated (edgeR, FDR < 0.1), downregulated (edgeR, FDR < 0.1), and all annotated genes in Hiraf/f Gdf9-Cre+ MII oocytes. (I) Boxplots show distribution of gene expression fold change for each gene expression level quintile (based on Hiraf/f gene expression levels). (J) Variance of gene expression within a given Hiraf/f or Hiraf/f Gdf9-Cre+ sample. In all cases, error bars indicate SEM. Statistical analysis was carried out using two-tailed unpaired Student’s t test (F and G), Kruskal-Wallis with Dunn’s post hoc test (H) or F test (J); ns, non-significant; *p < 0.05, **p < 0.01, and ***p < 0.001. See also Figure S6. Figure 5. Hira Is Essential for Transcriptional Transitions Associated with the Oocyte Developmental Program and Is Required for Repression of Aberrant Transcription (A) GSEA comparing genes of selected expression clusters during oogenesis (Figure S5B) and the ranked list of gene expression changes in Hiraf/f Gdf9-Cre+ MII oocytes relative to Hiraf/f oocytes. NES and FDR both were calculated in the GSEA program. For each cluster, each dot represents mean-normalized gene expression for consecutive stages of oocyte development. (B) Numbers of total transfrags and total annotated transfrags in Hiraf/f and Hiraf/f Gdf9-Cre+ MII oocytes (as computed by CuffCompare program) are shown. (C) Numbers of total annotated transfrags, unannotated entirely intronic transfrags, and unannotated entirely intergenic transfrags in Hiraf/f and Hiraf/f Gdf9-Cre+ MII oocytes (as computed by CuffCompare program) are shown. In all cases, error bars indicate SEM. Statistical analysis was carried out using two-tailed Student’s t test (*p < 0.05). See also Figures S5 and S6. Figure 6. Continuous Histone Replacement Is Required for Efficient De Novo Methylation during Oogenesis (A) Reduced total 5mC was measured by LC-MS in GV (Hiraf/f and Hiraf/f Gdf9-Cre+ ) and MII (Hiraf/f and Hiraf/f Zp3-Cre+ ) oocytes. (B) Global levels of DNA methylation quantified by scBS-seq in the CpG (CG) and non-CpG (CHH/G) contexts are shown. (C) Example shows CpG methylation quantified over 3-kb sliding windows (1.5-kb steps) for published GV datasets (Shirane et al., 2013; WGBS, top), Hiraf/f, and Hiraf/f Gdf9-Cre+ (scBS-seq). (D) Distribution shows the 3-kb genomic windows in the indicated bins of DNA methylation in Hiraf/f oocytes (top, horizontal, percentage indicating the proportion of methylation bins) and their corresponding DNA methylation values in Hiraf/f Gdf9-Cre+ oocytes (bottom, vertical columns). (E) Pie chart distribution shows the 3-kb genomic windows presenting statistically significant (chi-square test, p < 0.01) changes in Hiraf/f Gdf9-Cre+ versus Hiraf/f (percentage indicates the proportion of each segment). (F) Effect of Hira deletion on DNA methylation is global and independent of the genomic context. DNA methylation at CpGs (five reads coverage) was determined and averaged for each genomic context. (G) CpG islands (CGIs) methylated in Hiraf/f oocytes are globally hypomethylated in Hiraf/f Gdf9-Cre+ oocytes. CGI methylation was defined for each genotype, and only CGIs hypermethylated in Hiraf/f (>80%) are displayed, for both Hiraf/f (blue) and Hiraf/f Gdf9-Cre+ (red), and ordered on the x axis based on their genomic location. (H) Effects on DNA methylation in Hiraf/f Gdf9-Cre+ oocytes are more pronounced at highly expressed genes. DNA methylation was quantified for genes binned into expression percentile based on the scRNA-seq data (boxplot with plus signs representing mean values and horizontal bars representing median values). (I) Comparison between DNA methylation and gene expression differences in Hiraf/f and Hiraf/f Gdf9-Cre+ oocytes. See also Figure S7. To address the biological significance of continuous histone replacement in a physiological context, we have generated a genetic deletion of the histone chaperone Hira in the early stages of mouse oogenesis. Developing mouse oocytes represent a unique experimental system as postnatal oocytes undergo developmental transitions, including major transcriptional changes and widespread de novo DNA methylation, in the absence of DNA replication. Our results show that the chromatin of developing oocytes is highly dynamic, with histone turnover being observed also in the transcriptionally inert GV-stage oocytes (Figures 1C and 4A). We demonstrate that constant histone replacement is necessary for the maintenance of normal chromatin homeostasis in vivo. Depletion of Hira during early oocyte development leads to a severe reduction of histone load, compromised developmental progression, and progressive oocyte loss (Figures 2, 3A, and S2G). We note that, albeit pronounced, our observed phenotype is milder in comparison to the recently reported oocyte death in H3.3 knockout mice (Tang et al., 2015). We attribute this difference to the presence of an alternative ATRX/DAXX H3.3 chaperone complex, which, although present in our system, cannot functionally replace Hira-driven H3.3 deposition (Figures S2A–S2C). 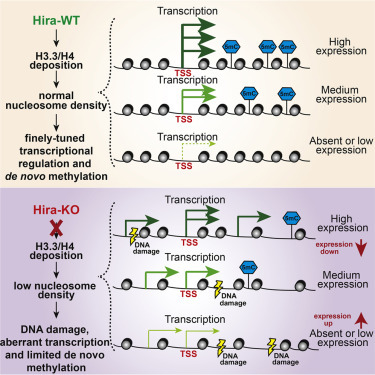 Our experiments document that, while lacking the normal ability to incorporate H3.3 and H4, Hira-deleted growing oocytes remain transcriptionally active, which results in chromatin with severely reduced histone content, increased DNase I sensitivity, and signs of DNA damage (Figures 3 and S2B). Reminiscent of the phenotype associated with Hira depletion in yeast (Blackwell et al., 2004; Greenall et al., 2006) and H3.3 depletion in mice (Bush et al., 2013; Lin et al., 2013) and Drosophila (Sakai et al., 2009), the compromised chromatin structure leads to chromosome segregation defects and aberrant first polar body extrusion (Figure 2D). However, the observed chromosome segregation defects in the Hira-depleted oocytes are not linked with aberrant CenpA incorporation, as previously suggested in somatic cells (Figure S2C; Bush et al., 2013). Non-replicative Hira-depleted oocytes uniquely reveal the importance of histone replacement on transcriptional regulation in the absence of replication-coupled chromatin assembly. Although transcription can continue from histone-depleted chromatin, our study shows that the lack of histone replacement has a major impact on the dynamic range of gene expression. In the context of histone-depleted chromatin, genes can neither be efficiently silenced nor effectively activated. Additionally, the lack of normal histone occupancy leads to increased spurious transcription from otherwise not-transcribed regions of the genome, suggesting an evolutionarily conserved role for the Hira histone chaperone complex (Anderson et al., 2009). Our results additionally reveal an unexpected connection among continuous H3.3 replacement, transcription, and de novo DNA methylation in developing oocytes. Following Hira depletion, more accessible chromatin with reduced histone load leads to significantly reduced DNA methylation (Figures 6A–6G). We note that, although in other systems DNAmethylation changes result in pronounced transcriptional outcomes (Yang et al., 2014), reduced DNA methylation is not likely to contribute to the observed transcriptional changes in Hira-depleted oocytes, as Dnmt3l knockout oocytes lacking DNA methylation do not display any transcriptional phenotype (Kobayashi et al., 2012). Our data suggest that the observed methylation phenotype cannot be attributed to downregulation of the Dnmt3a/3l complex, and, although we cannot exclude locus-specific effects on Dnmt3a/3l recruitment, the observed reduced DNA methylation is likely due to altered enzymatic activity of Dnmt3a in the absence of normal levels of chromatin-bound H3 (Figures 1C, 1E, and S2B). In this context, the N-terminal part of H3 has been shown in vitro to be required for allosteric activation of Dnmt3a catalytic activity (Guo et al., 2015). Our study thus provides the first support for this effect in an in vivo setting. The observed effect is more pronounced in highly expressed genes (Figure S7I), in agreement with the expected role of transcription in inducing nucleosome depletion in Hira-depleted oocytes. Furthermore, CpG island methylation is greatly reduced in Hira-depleted oocytes (Figure 6G) and methylation loss is more pronounced at regions with high CpG density (Figure S7K). As the Dnmt3a enzyme has been shown to operate in a non-processive manner (Dhayalan et al., 2010), stimulatory effect of the unmodified (H3K4me0) H3 tail might be necessary to ensure a high level of methylation at these regions. Figure 7. Role of Hira in Transcriptional Regulation and De Novo DNA Methylation during Oogenesis During oogenesis, normal chromatin structure and nucleosome density is maintained by Hira-mediated continuous H3.3/H4 replacement. This is required for fine-tuned transcriptional regulation and efficient de novo DNA methylation. Supplemental Information includes Supplemental Experimental Procedures, seven figures, and four tables and can be found with this article online at http://dx.doi.org/10.1016/j.molcel.2015.10.010. Essentially, the scientists found that disturbing H3.3/H4 deposition alters chromatin structure, resulting in increased DNase I sensitivity, the accumulation of DNA damage, and a severe fertility phenotype. The research addresses the importance of histone turnover in maintaining genomic fidelity and adds to our understanding about the mechanisms in place to protect the integrity of the genome as it is remodeled and reshaped. Studying this in the context of the developing oocytes provides new insights into our dynamic genome, unclouded by the complications of DNA replication, and also reveals how important maintaining chromatin dynamics is to the integrity of our gametes.